Morning whiskey classes. Education is a large part of what the Whiskey Library does. Because it's a library. Shakin' it up in the new Green Room. Whiskey stacked so high, you need a ladder to reach them. Seriously, check out the ladder. The round table set up for a private tasting. Membership has its benefits. Whiskey Library This might be heaven. 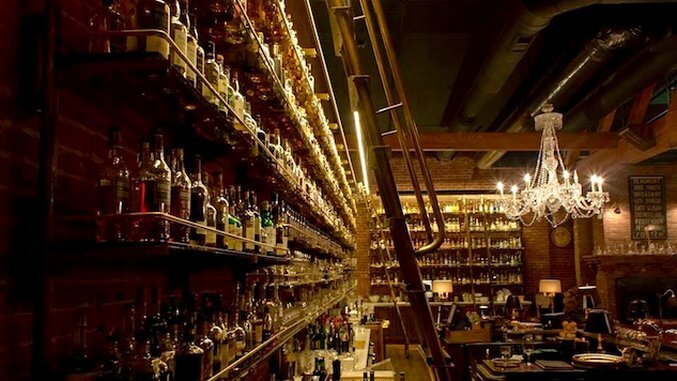 The Multnomah Whiskey Library might be the best whiskey bar in the country. More than 1,200 bottles grace the walls of the bar, which is staffed by some of the smartest whiskey geeks in the city. The bar is truly gorgeous (think aged leather, roaring fires and dark-stained wood), the service is outstanding, the food pairings are masterful…even the new waiting room, a separate bar downstairs from the Library, is incredible. Want to go? Good luck. The Library is open to the public, but only members can make reservations. And they’re not taking new members right now. You can show up and hope you get a table. And like we said, the new waiting room is legit. Check out the photos and see for yourself.